Chicken and crepes, breakfast chimichangas and mimosa flights are on the new weekend menu. Scott Elmquist An eggs-your-way platter is one of many breakfast items on Bar Solita’s new brunch menu. Breakfast pizza was already on the regular menu, but a few months after its debut, Bar Solita is leaning into the brunch trend. As of last weekend, the Mediterranean-focused menu now includes an expansive, creative weekend selection dubbed the Flamingo Brunch. You've got your staples like biscuits and gravy and an eggs platter, of course, but you'll also find twists on classic brunch items. Rather than chicken and waffles, two hefty pieces of crispy breaded chicken come alongside a serving of red velvet crepes, with dollops of whipped cream on the plate. Bar Solita's take on a breakfast burrito is the breakfast chimichanga, a soft tortilla rolled around fluffy scrambled eggs and sausage gravy, deep-fried and smothered in green goddess dressing and fennel pico. Other items include a Mexican chocolate parfait, breakfast empanadas, shrimp and curry polenta, harissa smoked chicken wings and a giant, shareable cinnamon bun. New chef Lucky Abimbola transferred from Little Saint to Bar Solita about two months ago, just in time to dig into the brunch menu. The chicken and crepes is her favorite. "Usually when you see chicken on a brunch menu, you think waffles," Abimbola says. "This is just kind of an adult way to eat chicken for breakfast." On the bar side, why have just one flavor of mimosa when you can have five? Served alongside a pour-yourself bottle of champagne, the mimosa flight features small glasses of sweet, fruity concoctions including strawberry-mint and pineapple-honey, plus the standard orange juice. There's enough of each flavor to mix with the entire bottle of champagne, so you might want to split this with your brunch buddy or spring for an Uber. If sweet and bubbly isn't your thing, keep an eye out for the bloody mary cart. Pushed around the dining room by a bartender, it features at least three types of vodka, several tomato-based mixes, including locally made Texas Beach bloody mary mix, and add-ins like horseradish, Worcestershire sauce, lemons and olives. No idea what you want? Just order a dealer's choice, and let the roving barkeep know your preferred spice level. There's also a boozy, for-the-table cocktail served in a giant ceramic flamingo, which a diner describes as a "brunch version of a Long Island iced tea." 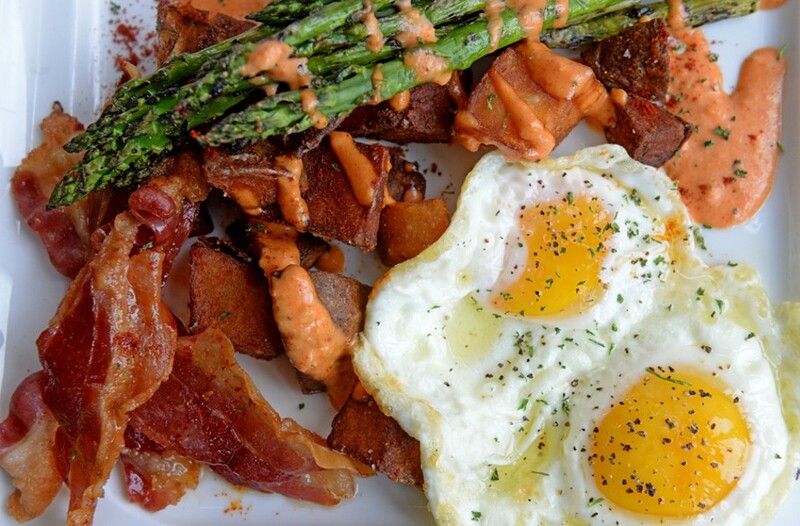 Brunch is available from 10 a.m. to about 3:30 p.m. on Saturdays and Sundays. Mondays - Fridays 11 a.m. - 11 p.m.
Saturdays 10 a.m. - 1 a.m.
Sundays 10 a.m. - 11 p.m.